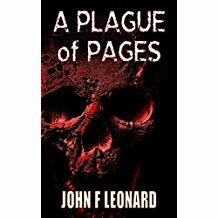 I chose to read A Plague of Pages by John F Leonard as a member of Rosie’s Book Review Team and received a copy from the author. This does not alter my review in any way. If anyone follows my reviews they will have noticed I am something of a fan of Leonard’s work by now. * This can prove problematic when you then read something not quite on a par with the previous work by that author, which could have been the case here as A Plague of Pages is considerably longer than the previous short stories. However fortunately A Plague of Pages does not disappoint. In fact, quite the opposite, given the longer format Leonard has greater opportunity to hook the reader in with his excellent writing and to develop the storyline into something that keeps those pages turning. The story starts with the police attending a rather bizarre death in a library and I enjoyed the relationship, or rather the lack thereof, between Detective Sergeant Adi Shadwell and the decidedly charmless constable, Ricky Douglas. We then go back a little in time to meet Anthony Eames who has been brought low, from being married and having a successful estate agency, by those who should have been there to support him. He has turned his back on all that and in a bid to start over has decided to write instead. He chooses to do this with a pen left to him by his father. It is only when the consequences of doing so start to be revealed that the true horror of what he has unleashed comes home to him. Or does it? Maybe he is just having a breakdown? There is only one way to find out. Write something where he can check the outcome. I won’t say anything further for fear of spoiling this excellent read for someone else, suffice to say there is plenty to frighten you and Anthony has to revisit his family history to uncover the provenance of the pen while protecting it from those who view it with green-eyed envy. Not for the squeamish perhaps but otherwise it’s an excellent story I’d recommend to all. *I reviewed Doggem here and Call Drops here, if you’re interested. I love it as well, Georgia.